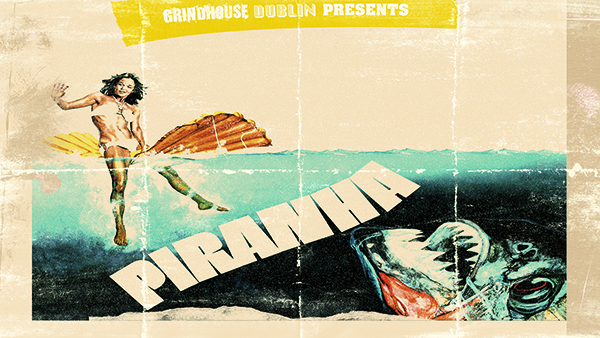 Grindhouse Dublin, in association with Light House Cinema, are proud to present Piranha, the original 1978 satirical horror film directed by Joe Dante and produced by Roger Corman! You were shocked by the great white shark - Now... you are at the mercy of 1000 jaws! Although derided by critics at the the time of release, this fun debut feature from Joe Dante laid the groundwork for his mixture of tongue in cheek horror films to come (The Howling & Gremlins). Piranha is a cult classic that not only spawned a sequel (directed by James Cameron no less), but a modern day remake and it's own sequel. Piranha was given the thumbs up by director Steven Spielberg in 1978 (“the best of the Jaws rip-offs”), despite a pending litigation from Universal Studios (who were releasing Jaws 2 the same summer), which was ultimately dropped thanks to the endorsement from Spielberg. The film will commence at 11pm, Friday, May 25th. There will be drinks and merriment from 9pm in the Light House Cinema Bar.